If you're looking for a deliciously warming and feel-good weekday supper or an easy to throw together weekend lunch, then this recipe is the one for you! 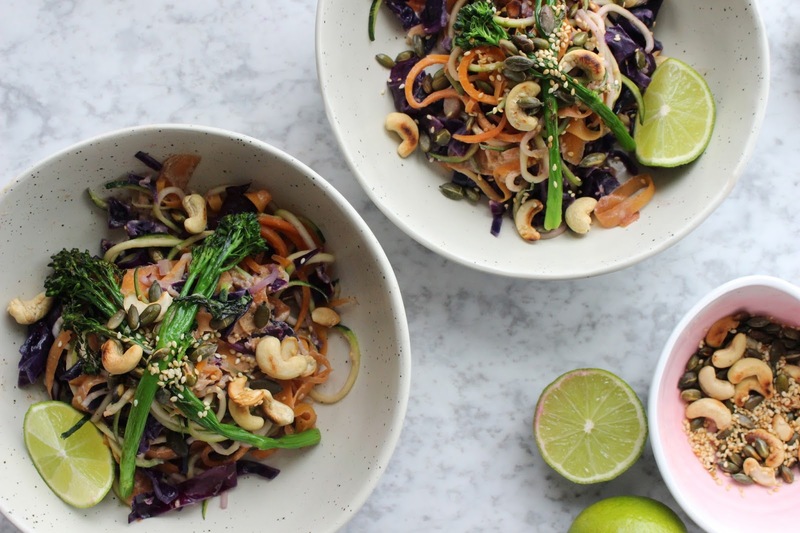 A take on the popular raw vegan pad thai, this heated, toasted, stir-fried option is the perfect winter-warming comfort food, that will leave you feel satiated and full without the crippling food coma! One of the best things about this recipe is it is so adaptable; as long as you have a few staple veggies as the bulk (the noodles), a simple sauce to coat the veggies, and a sprinkling of toasted nuts or seeds, you're there! If you have nut/seed allergies something like roasted chickpeas would make the perfect substitute topping and add a healthy dose of protein too! 1. First, take your red cabbage, courgettes and carrots and make the noodles. You can do this a number of ways, and I used a variety to make mine. For the red cabbage I started by halving it, as this should be enough for two portions. I then roughly shopped this into thin strands (like you would to make coleslaw!) For the carrots I simply took a handheld peeler and peeled it into thin strips to make these fine ribbons. For the courgette, I got a little more technical and used my beloved spiraliser to make these spaghetti style strands (commonly known as courgetti) ! I would highly recommend getting one of these spiralisers, as you can pick them up pretty cheaply and they give you so many great meal options. If you don't have one to hand you can simply make courgette ribbons à la the carrots, or if you're after a cheat option, check out your local supermarket's pre-prepped veg section as most have a great offering of pre-spiralised veg these days. I also added in some finely sliced red pepper to add colour and flavour! 2. Next up, dice the fresh ginger and crush/dice the garlic cloves. Throw these in a large saucepan or wok, and heat with some coconut oil before tossing in all the veg noodles/ribbons. You can stir fry these for as long as you like as they can be eaten raw if you prefer! But I like to heat and soften them so they take on a more noodley texture and to make the meal more Winter-appropriate! I also like to fry up some broccoli in a separate pan, this ensures it's properly softened and gives it a delicious grilled flavour. 4. Whilst your veg is all cooking away, take this opportunity to make the sauce! 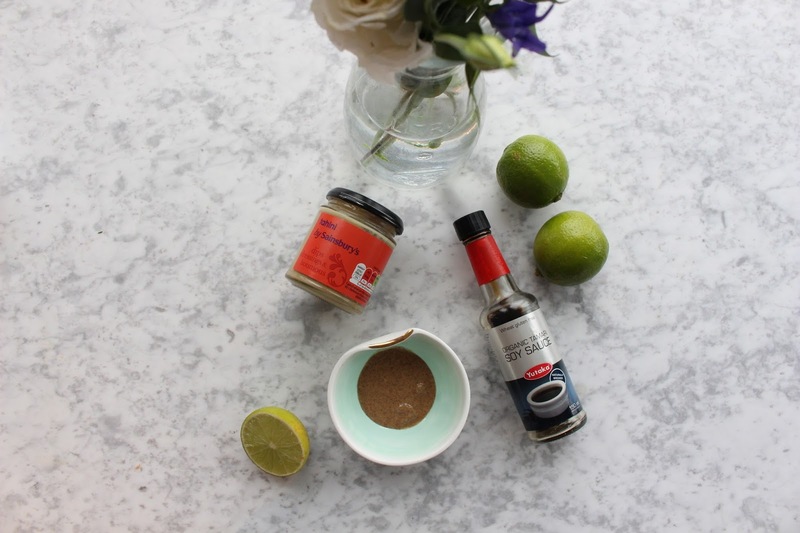 I simply mixed together the tahini and nut butter until it was a perfectly smooth paste, then squeezed in the lime juice and added a couple teaspoons of Tamari (gluten-free Soy Sauce) to taste. Once all mixed up this creates the perfect creamy sauce texture. I used almond butter in mine as I love the flavour, but for a more authentic Pad Thai flavour you can go for peanut butter. If you want it more creamy and milder in taste then cashew butter is also a great option! If you don't have a fresh lime or lemon to hand, apple cider vinegar is a great food cupboard substitute as it adds the same sharp flavour. 5. Now the final component you need to prep is the nutty, seeding topping. Simply throw your choice of nuts/seeds into a pan on a low heat, and ensure you keep them moving around so they don't burn! They should only take a couple of minutes to take on a beaut golden brown hue. Toasting these in the pan may seem like a whole loada extra effort to go to, but I can't stress how much this transforms the flavour! I love using pumpkin seeds on top of most of my meals as they add a delicious flavour and crunch when toasted. Sesame seeds also add a great taste to Asian-inspired dishes, and I then opted for toasted cashew nuts, but toasted peanuts would work well here too! 6. The final step is the most simple, just combine everything together and dish it up. Coat the veggie noodles in the creamy sauce, then spoon the mixture into a dish. Lay the pan-fried broccoli on top, and sprinkle with the toasted nuts and seeds. Such a simple dish but so so full of flavour and the perfect warming meal. I'm definitely looking forward to experimenting with this recipe more over the Winter months!